Welcome to the eleventh installment of Past Greatness, a monthly series I'll be doing showcasing great, older works. All albums listed below are of 8+ quality. This month's album is a Pop-defining 60's diddy created by a future madman turned murderer. Growing up, I, along with half a dozen or so cousins, used to spend the summer months at our grandparents house while the parents scampered off to work. We ranged in age from 4 to 14, all coming together under one roof, one family, to soak up the sun, rummage through old VHS tapes, race around the pool and swing set, play Gran Turismo on the Playstation 1, and get unnecessarily dowsed in sunscreen by our grandmother. The memories are scarce but potent. We used to film ourselves conducting outrageous acts, simulate a restaurant on the second floor, down freezer pops like they were shots, watch endless episodes of 90's Nickelodeon shows, and poke fun at my grandma's obsession with Richard Simmons' Sweatin To The Oldies. That last one, in retrospect, is perhaps the most curious. Not for any reason in particular, other than the fact that, years later, I'd obsess over the very thing she danced to; music. Since surrounding myself with the medium in all forms, nothing had cracked that nostalgia I had experienced in that decrepit, one-hundred year old house. Until now. Since graduating college, for reasons unknown, my recollection of events both grand and small has begun to diminish. It's a scary occurrence, especially for someone who clings to the fear of dementia one day happening to them. It's hard enough to recall what a workmate said to me mere days ago, yet alone personality-creating flashbacks from years past. For a brief moment, virtually every 37 minutes when I listen to it, Presenting The Fabulous Ronettes makes me remember. It is exactly the type of album, from sound to style to flair to look, that appeared in cassette form in my grandparents' antiquated radio. Even the cover itself, through this purely digital laptop by which I type from, gives off a mighty odor of dust, as if it had been sitting there since 1964; the year in which it released. It's transportive, the type of album that embodies a decade of stereotypes. Oversized sedans, poodle skirts, beehive hairdos, drive-in movie theaters, housewives dreaming of the world. 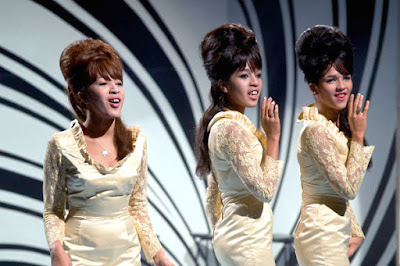 That's what the Fabulous Ronettes, through Veronica's goddess-like vocals, the background singers' infinitely catchy melodies, and Phil Spector's infamous wall of sound cascade, represents. Unlike a handful of other wistful albums in my catalogue, ones that reimagine a decade without actually living through it (The Caretaker's work, Trance Farmers' Dixie Crystals, Chuck Person's Eccojams Vol. 2, etc. ), Fabulous Ronettes excelled by enduring the era. This was the music of the late 50's and early 60's, namely for those older folk clinging onto a classiness and conservatism revolutionary acts like Bob Dylan and The Rolling Stones aimed to move past. 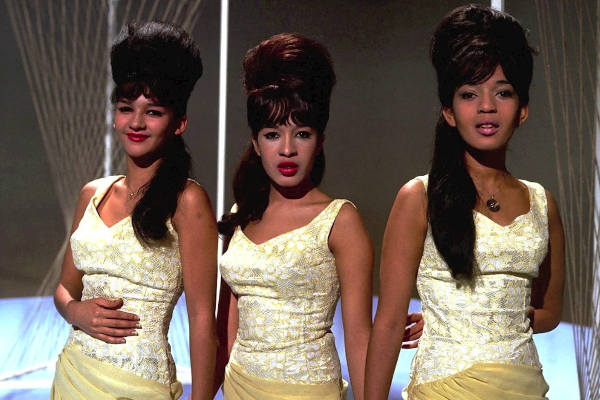 The Ronettes, therefore, were very much rooted in rooting themselves. From the get-go, on 'Walking In The Rain,' the trio (really, quartet including Spektor) establish their moralistic high ground. Each and every song is, essentially, about a woman doing her due diligence to finding a man and loving him unconditionally. The excessiveness illusion of affection works as enlightenment for how women were treated in that era; as housewives meant to service the working male. While genres of music can come back in style (there's still Indie groups to this day who dabble in Brill Building), an album like Fabulous Ronettes will never, ever happen again, if only for the exorbitant regression the submissive lyrics contain. The album acts, simultaneously, as a history lessen for how far gender equality has come. With the aesthetic of Fabulous Ronettes taking precedent over everything else, it's easy to look past the successes of the music itself. This is, after all, the reason why The Ronettes initially drew fame, not because of the reason I'm lured in; nostalgia and a fascination with their cultural principles. Thanks to Phil Spector's production, the sound of Fabulous Ronettes is stunning. Much has been said about his style and approach, essentially laying the groundwork for what Brian Wilson and the Beach Boys would profit on for the next decade. Brill Building through an uncomplicated Pop lens. Every song, apart from the live rendition of 'What'd I Say,' adheres to a singular idea. Use Veronica as a template for the candid, lonely housewife, swelling her vocals in excitement like a dog would act when its human has come home, add a barrage of systematic instrumentation that sounds like the harmonious simmering and clanging of various laundry room appliances, and layer it all with undemanding background vocals that make it easy to sing along, while easing concerns that you're not alone. The stumbling block of that previous sentence no contention to how effortless Spektor and the girls make it sound in music form. Enough aggrandizing, let's get into the specifics. Of course, 'Be My Baby' gets, and deserves, all the praise. Accounts that it's one of the greatest compositions ever aren't so far-fetched, the brimming approach to orchestration, pace, and vocals about as close to perfection as one will witness. However, while it is indeed the standout track, the surrounding eleven cuts aren't disposable. On '(The Best Part Of) Breakin' Up' and 'I Wonder,' The Ronettes exhibit dominance over their self-sufficient harmonizing. With 'Walking In The Rain' and 'So Young,' Veronica sets herself apart with formidable vocals that present femininity without leaning on a crutch or squeak. Tracks like 'Baby, I Love You' and 'Chapel Of Love' can be seen as the Phil Spector show, with dazzling arrangements and sterling progression. There's even 'How Does It Feel?' and 'When I Saw You,' two instances of opposing emotion, substantiating that the quartet's capable of anything. However, what they do best is sprayed all across Fabulous Ronettes, an album that's far more than just a nostalgic bender. From every angle, The Ronettes' only traditional LP is a time capsule that can explain the past and be admired in the future.